Wish I could go to this, but unfortunately it's too far of a drive for me. Monica, we wish you the very best in your presentation at Stanford! 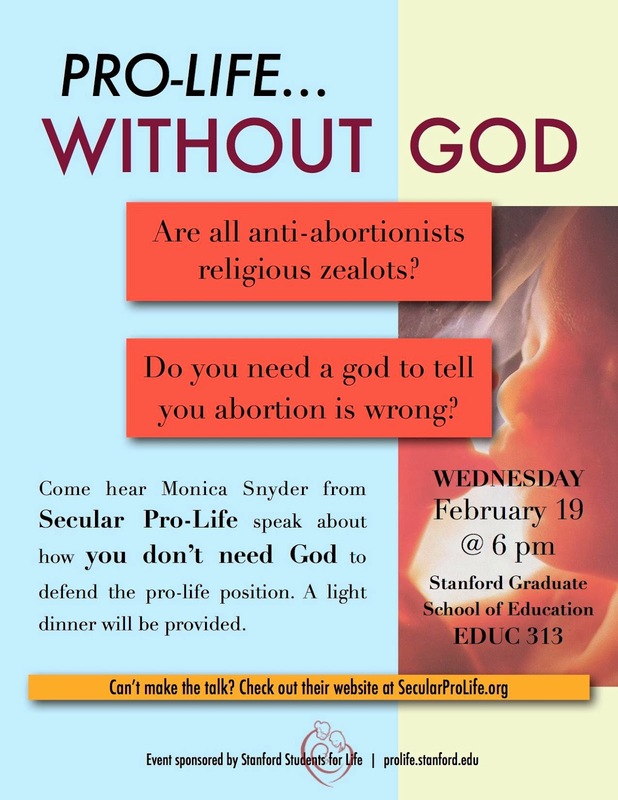 On the other hand, the question on the poster announcing the presentation, "Are all anti-abortionists [sic] religious zealots," could be interpreted as unnecessarily provocative, and our answer is, no--in fact very, very few people who are against abortion are religious zealots, two or three maybe? While most anti-abortion people have some religious motivation that motivates their fight against abortion, they cannot be called zealots in the normal use of the term--fervent, devout, yes, definitely. Actually, this new phenomenon of secular pro lifers should be grateful that fervent, devout Christians started and then carried on the fight against abortion these 41 years. Then there is your question on the poster, "Do you need a god to tell you that abortion is wrong?" This is, of course, very accurate, since common sense alone will tell you that the child who has just left the womb is respected but who, minutes before, seconds before, could be killed with no compunction--that use of common sense does not need a god to confirm it, or even God. But that too is unnecessarily provocative. There are much better ways to promote the the fight against abortion among nonreligious people than these two ideas. Please let us know how your presentation goes. I hope that the pro life blogs pick it up. Have you contacted them? I mean Live Action, Students for Life of America, LifeSiteNews, LifeNews, ProLife America, Heroic News. Barbaro70, the Students for Life at Stanford designed the poster (the group which invited us), not Secular Pro-Life. And most of them are Christian, to my understanding. You'd have to ask them about their reasoning for the design--we simply re-posted it. Barbaro, I think the point is to grab the attention of people who hold to that false stereotype. The idea is to bring people into the discussion who believe it, then *dispel* that belief. So it's not saying pro-lifers are religious zealots, it's actually saying, "Hey do you believe this? Let me show you why that's untrue." Not a bad interpretation, thanks. But I still believe that nothing should appear to differentiate Christian and secular pro lifers--in unity, strength! She did well, and I'm pro-choice. She didn't change my mind of course, I've been thinking though abortion longer than she's been alive, but she did just fine. Your God very much gets in the way of your arguments. In a Secular Country you don't argue But God Said So. When you do, expect to be ignored and I'm betting that's not what you desire eh?